In a recent FiveThirtyEight article, a statistical approach known as magnitude based inferences, popular in sports sciences, was severely criticized. 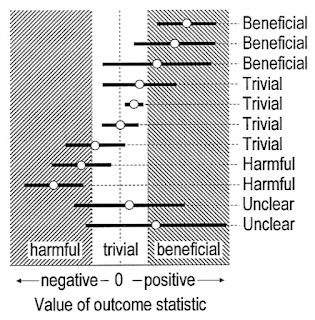 Critically evaluating approaches to statistical inferences is important. In my own work on statistical inferences, I try to ask myself whenever a problem is identified: "So how can I improve?". In this blog, I'll highlight 3 ways to move beyond magnitude based inferences, achieving the same goals, but with more established procedures. I hope sport scientists in doubt of how to analyze their data will learn some other approaches that are less contested, but equally useful. 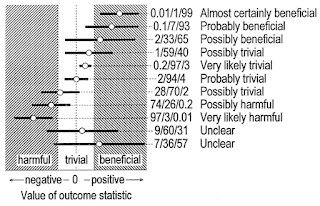 The key goal in magnitude based inferences is to improve upon limitations of null-hypothesis significance tests. As Batterham & Hopkins (2006) write: “A confidence interval alone or in conjunction with a P value still does not overtly address the question of the clinical, practical, or mechanistic importance of an outcome.” To complement p-values and confidence intervals, they propose to evaluate confidence intervals in relation to two thresholds, which I prefer to call the ‘smallest effect size of interest’. Although I’m not a particularly sporty person, I recently participated in the Rotterdam City Run, where we ran through our beautiful city, but also through the dressing room of a theater, around an indoor swimming pool, a lap through the public library, and the fourth story of a department store. The day before the run, due to train problems I couldn’t get to work, and I wasn’t able to bring my running shoes (which I use at the university sport center) home. I thought it would be OK to run on sneakers, under the assumption ‘how bad can it be’? So let’s assume we examine the amount of physical discomfort people experience when running on running shoes, or on normal sneakers. As we discuss in Lakens, McLatchie, Isager, Scheel, & Dienes (under review), Kelly (2001) reports that the smallest effect size that leads to an individual to report feeling “a little better” or “a little worse” is 12 mm (95% CI [9; 12]) on a 100 mm visual analogue scale of pain intensity. So let’s say I would have been fine with running on sneakers instead of real running shoes if after the run I would be within 12 mm of the pain rating I would have given on good running shoes. In other words, I consider a 12 mm difference trivial – sure, I didn’t have my running shoes, but that’s a trivial thing when going on a city run. I also leave open the possibility that my running shoes aren’t very good, and that I might actually feel better after running on my normal sneakers – unlikely, but who knows. In formal terms, I have set my equivalence bounds to a difference of 12 mm when running on sneakers, or when running on decent running shoes. 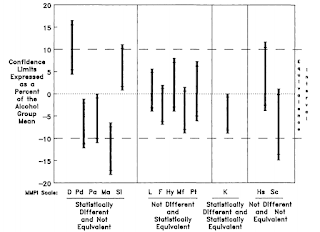 All differences within this equivalence range (the light middle section in the figure below, from Batterham and Hopkins, 2006) are considered trivial. We see the inferences we can draw from the confidence interval depending on whether the CI overlaps with the equivalence bounds. Batterham and Hopkins refer to effects as ‘beneficial’ as long as they are not harmful. This is a bit peculiar, since from the third confidence interval from the top, we can see that this implies calling a finding ‘beneficial’ when it is not statistically significant (the CI overlaps with 0), a conclusions we would not normally draw based on a non-significant result. 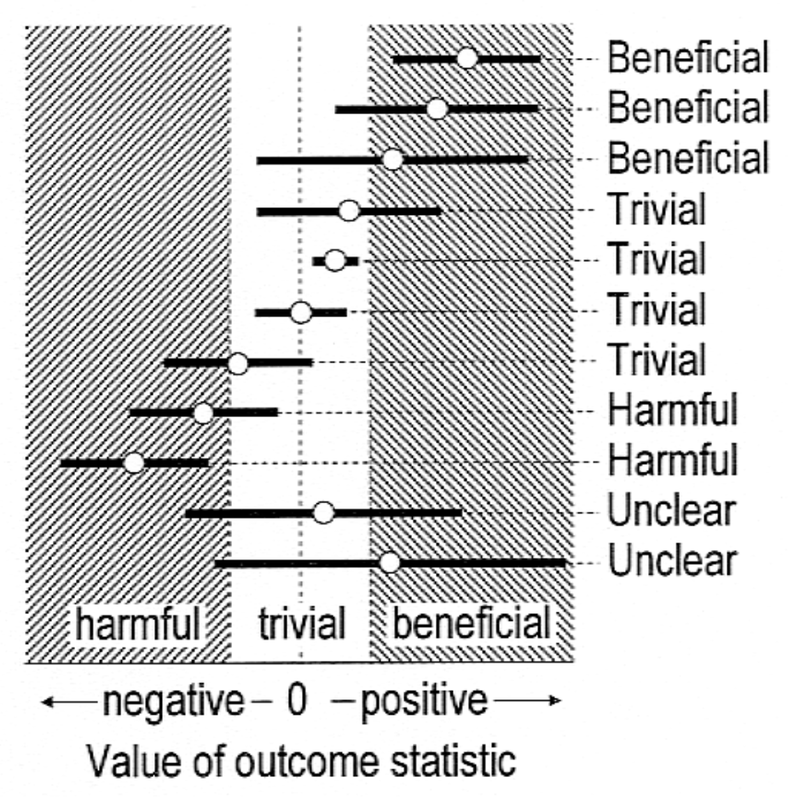 Batterham and Hopkins suggest to use verbal labels to qualify the different forms of ‘beneficial’ outcomes to get around the problem of simply calling a non-significant result ‘beneficial’. Instead of just saying an effect is beneficial, they suggest labeling it as ‘possible beneficial’. Even though Hopkins and Batterham (2016) had published an article stating that magnitude based inference outperforms null-hypothesis significance tests in terms of error rates, Sainani shows conclusively that this is not correct. The conclusions by Hopkins and Batterham (2016) were based on an incorrect definition of Type 1 and Type 2 error rates. 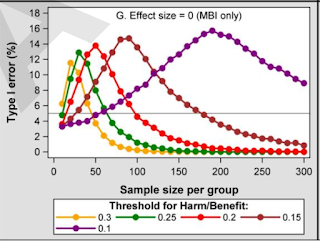 When defined correctly, the Type 1 error rate turns out to be substantially higher for magnitude based inferences (MBI) depending on the smallest effect size of interest that is used to define the equivalence bounds (or the ‘trivial’ range) and the sample size (see Figure 1G below from Sainani, in press). Note that the main problem is not that error rates are always higher (as the graphs shows) - just that they will often be, when following the recommendations by Batterham and Hopkins. The idea behind magnitude based inference is a good one, and not surprisingly, statisticians had though about exactly the limitations of null-hypothesis tests and confidence intervals that are raised by Batterham and Hopkins. The idea to use confidence intervals to draw inferences about whether effects are trivially small, or large enough to matter, has been fully developed before, and sport scientists can use these more established methods. This is good news for people working in sports and exercise science who want to not simply fall back to null-hypothesis tests now that magnitude based inference has been shown to be a problematic approach. Indeed, in a way it is surprising Batterham and Hopkins never reference the extensive literature to approaches that are on a much better statistical footing than magnitude based inference, but that are extremely similar in their goal. 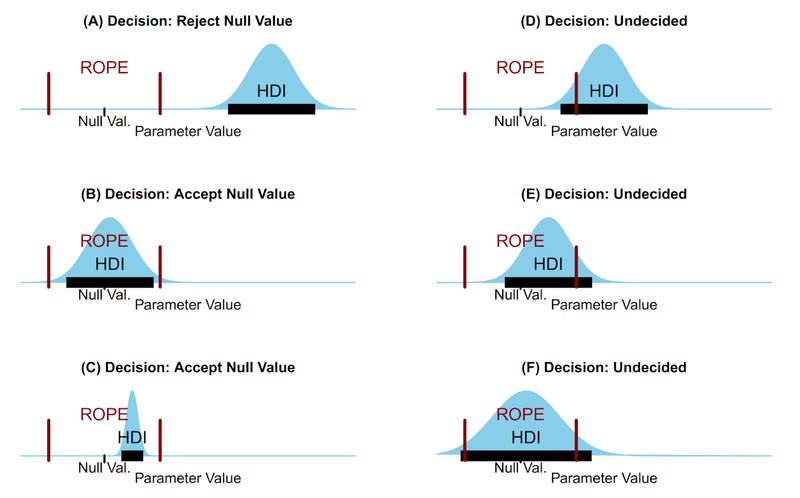 The first approach former users of magnitude-based inference could switch to is the ROPE procedure as suggested by John Kruschke (for an accessible introduction, see https://osf.io/s5vdy/). As pointed out by Sainani, the use of confidence intervals by Batterham and Hopkins to make probability judgments about the probability of true values “requires interpreting confidence intervals incorrectly, as if they were Bayesian credible intervals.” Not surprisingly, one solution moving forward for exercise and sports science is thus to switch to using Bayesian credible (or highest density) intervals. As Kruschke (2018) clearly explains, the Bayesian posterior can be used to draw conclusions about the probability that the effect is trivial, or large enough to be deemed beneficial. The similarity to magnitude based inference should be obvious, with the added benefit that the ROPE procedure rests on a strong formal footing. One of the main points of criticism on magnitude based inference demonstrated conclusively by Sainani (2018) is that of poor error control. Error control is a useful property of a tool to draw statistical inferences, since it will guarantee that (under certain assumptions) you will not draw erroneous conclusions more often that some threshold you desire. Error control is the domain of Frequentist inferences, and especially the Neyman-Pearson approach to statistical inferences. The procedure that strongly mirrors magnitude based inferences from a Frequentist approach to statistical inferences is equivalence testing. It happens to be a topic I’ve worked on myself in the last year, among other things creating an R package (TOSTER) and writing tutorial papers to help psychologists to start using equivalence tests (e.g., Lakens, 2017, Lakens, Isager, Scheel, 2018). 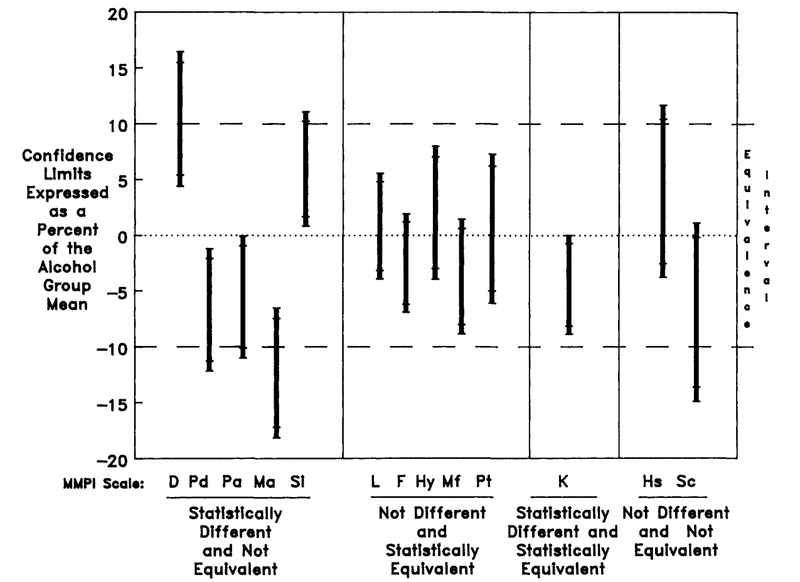 As the Figure below (from an excellent article by Rogers, Howard, & Vessey, 1993) shows, equivalence tests also show great similarity with magnitude based inference. It similarly builds on 90% confidence intervals, and allows researchers to draw similar conclusions as magnitude based inference aimed to do, while carefully controlling error rates. Another idea in magnitude based inference is to not test against the null, but to test against the smallest effect size of interest, when concluding an effect is beneficial. In such cases, we do not want to simply reject an effect size of 0 – we want to be able to reject all effects that are too small to be trivial. Luckily, this also already exists, and it is known as minimal effect testing. Instead of a point null hypothesis, a minimal effects test aims to reject effects within the equivalence range (for a discussion, see Murphy & Myors, 1999. 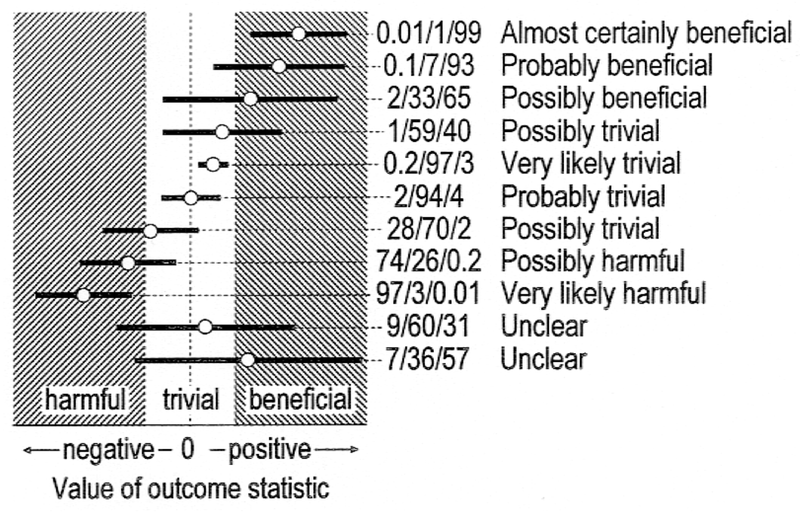 There are some good suggestions underlying the idea of magnitude based inferences. And a lot of the work by Batterham and Hopkins has been to convince their field to move beyond null-hypothesis tests and confidence intervals, and to interpret the results in a more meaningful manner. This is a huge accomplishment, even if the approach they have suggested lacks a formal footing and good error control. Many or their recommendations about how to think about which effects in their field are trivial are extremely worthwhile. As someone who has worked on trying to get people to improve their statistical inferences, I know how much work goes into trying to move your discipline forward, and the work by Batterham and Hopkins on this front has been extremely worthwhile. 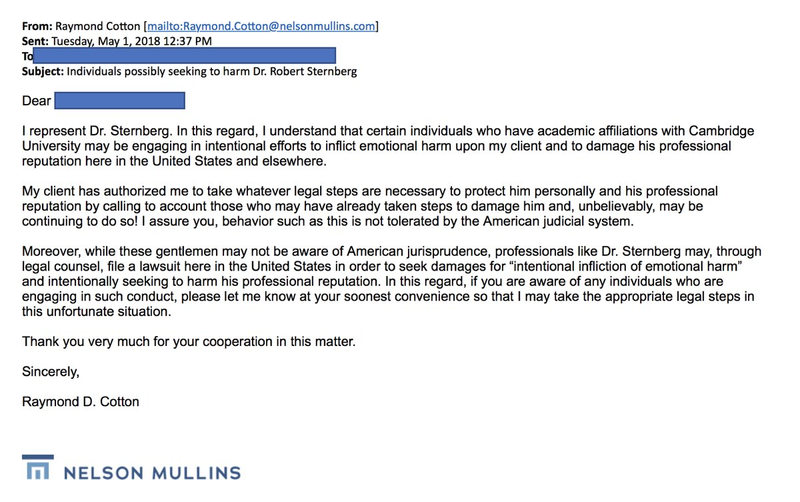 At this moment, I think the biggest risk is that the field falls back to only performing null-hypothesis tests. 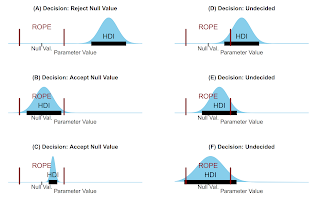 The ideas underlying magnitude based inferences are strong, and luckily, we have the ROPE procedure, equivalence testing, and minimal effect tests. These procedures are well vetted (equivalence testing is recommended by the Food and Drug Administration) and will allow sports and exercise scientists to achieve the same goals. I hope they will take all the have learned from Batterham and Hopkins about drawing inferences by taking into account the effect sizes predicted by a theory, or that are deemed practically relevant, and apply these insights using the ROPE procedure, equivalence tests, or minimal effect tests. P.S. Don't try to run 10k through a city on sneakers. Murphy, K. R., & Myors, B. (1999). 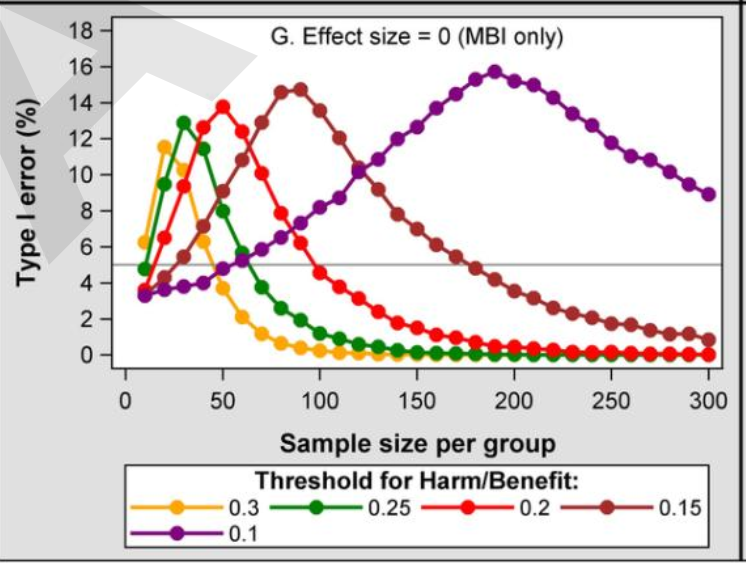 Testing the hypothesis that treatments have negligible effects: Minimum-effect tests in the general linear model. Journal of Applied Psychology, 84(2), 234.